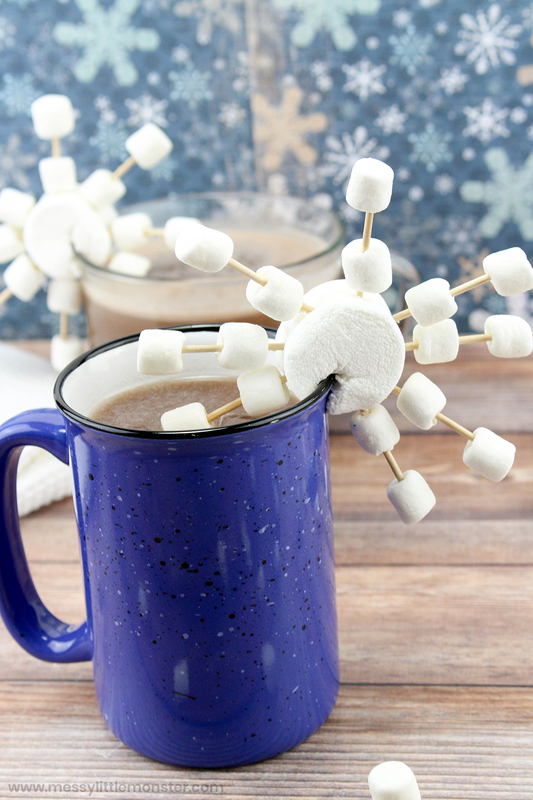 Snowflake marshmallows are are the perfect addition to your hot chocolate, and there is nothing better than a homemade hot chocolate to warm you up as the temperature drops! Whether you plan to make snowflake marshmallows as a tasty winter treat or whether you are looking for an educational activity for your toddlers and preschoolers, these marshmallow snowflakes are guarenteed to be popular. 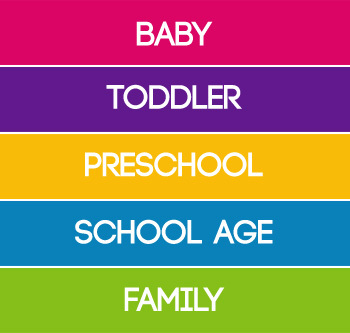 This fun and engaging activity is GREAT for those looking to engage in more STEM activities as well as being perfect for young children working on fine motor skills. Below you will find step by step directions to make your own marshmallow snowflakes! Be sure to grab this homemade hot chocolate recipe before you get started! For even more snowflake fun, check out this snowflake art and this snowflake craft! 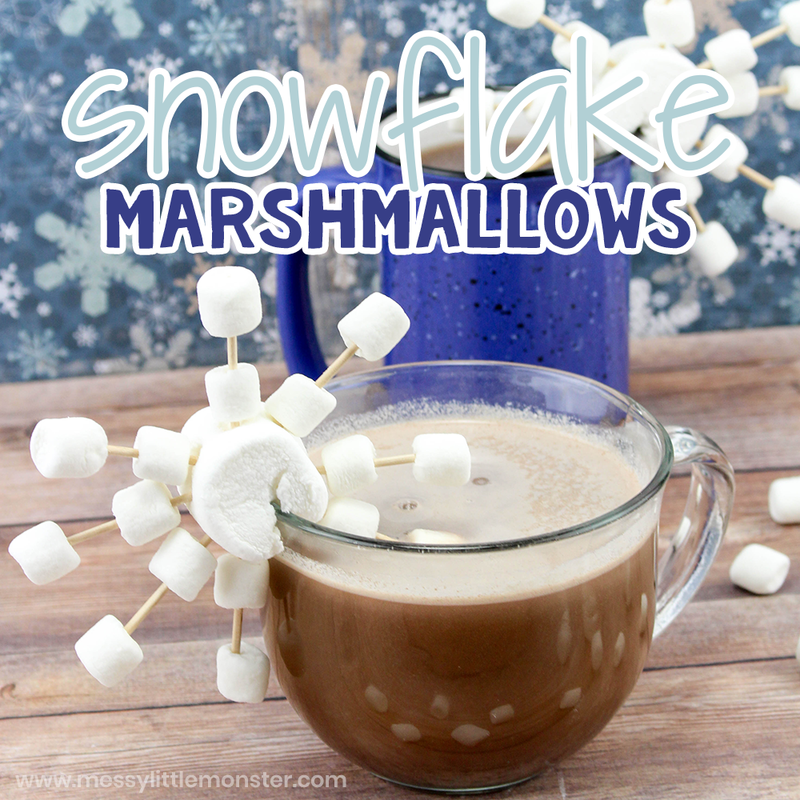 What I really love about these snowflake marshmallows is not only how much more fun it makes drinking hot chocolate... but also how educational making them can be for the kids! It is the PERFECT STEM activity as children can design their own snowflakes! For extra fun, find a really cool snowflake book or some images of real snowflakes and challenge the kids to copy the designs. 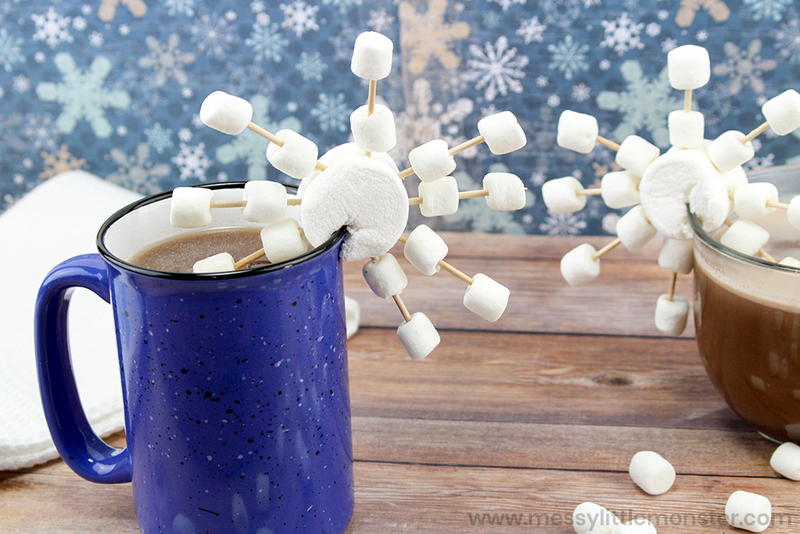 The educational fun doesn't stop there with these marshmallow snowflakes! 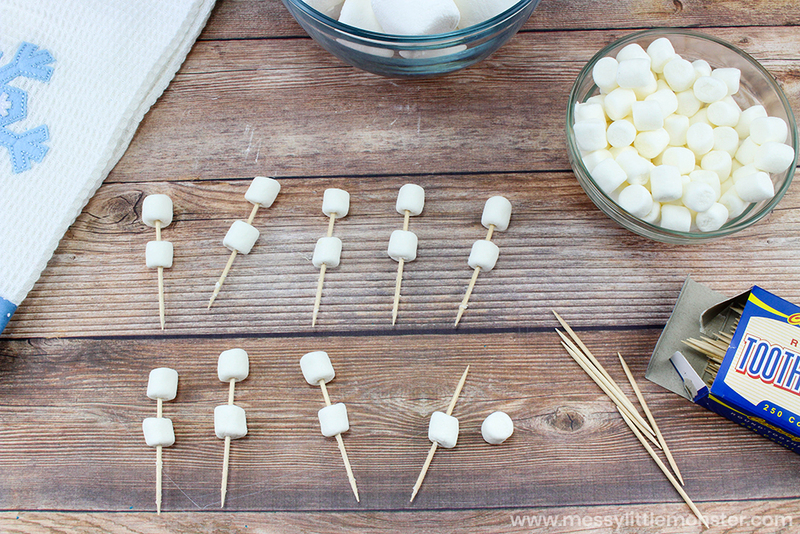 You can also teach maths by encouraging the kids to count the marshmallows and pushing marshmallows onto the toothpicks is great for toddlers and preschoolers working on fine motor skills. Scroll down below to get started making your own snowflake marshmallows. Before you get started, gather up your marshmallows and toothpicks. Make sure you have plenty on hand for the most fun creating different snowflake designs! If you are making these snowflake marshmallows with the kids have some images of snowflakes out to inspire them. 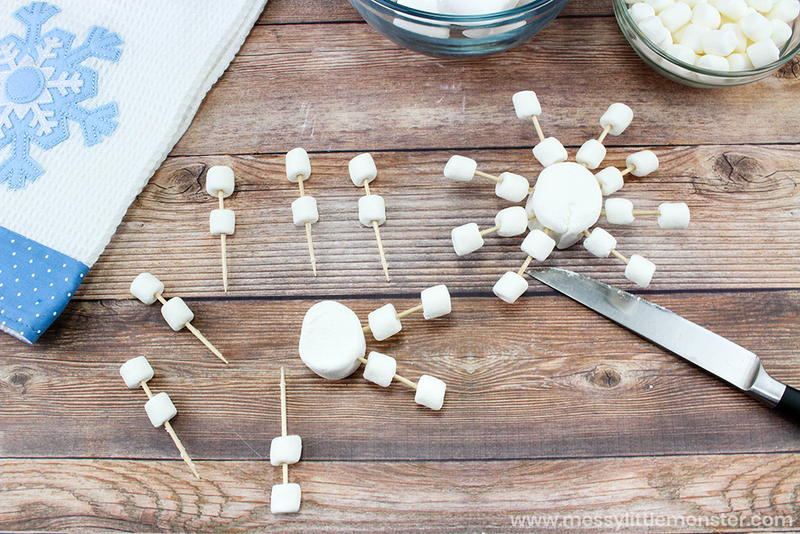 Below you can find instructions for how we made the marshmallow snowflake pictured, but these instructions are just for inspiration, the kids might come up with much better ideas! 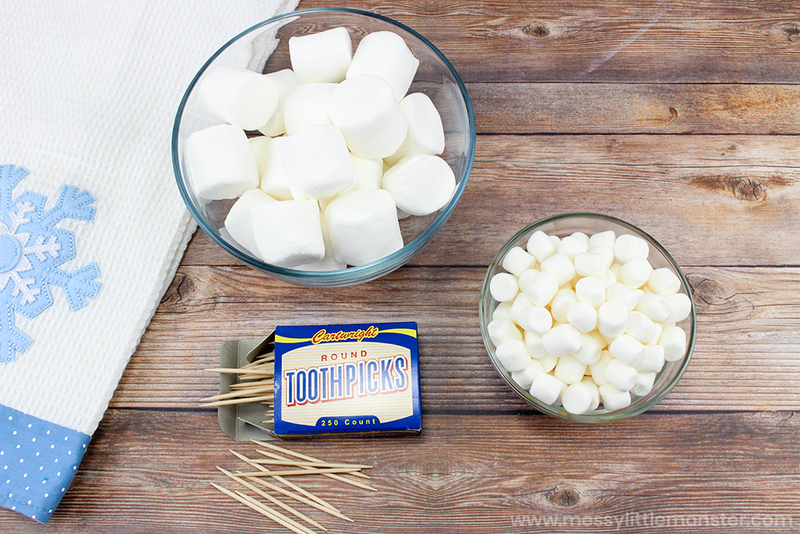 To get started, place mini marshmallows on toothpicks. In this example, we put 2 mini marshmallows on 8 toothpicks, leaving a space between them. Next, poke the toothpicks into the sides of the jumbo marshmallows. In this example, we poked the 8 toothpicks into the side of 1 jumbo marshmallow as shown below. Repeat for as many marshmallow snowflakes as you wish to make. Once you have finsihed making your marshmallow snowflakes it's time to enjoy them with a nice cup of homemade hot chocolate! 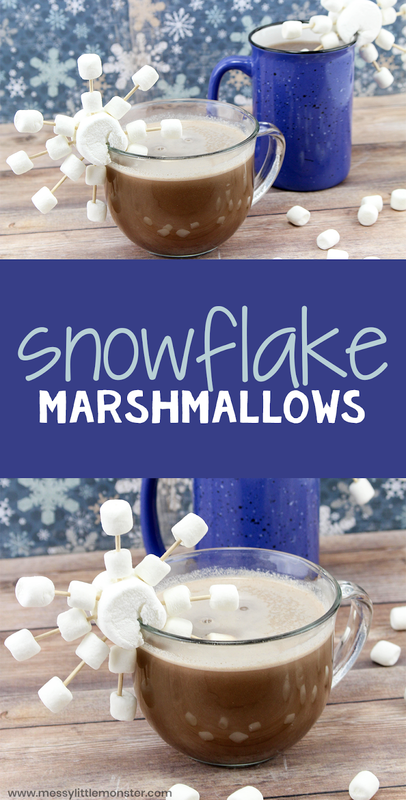 We hope you enjoy making these fun marshmallows snowflakes!! Kids will have SOOOOO much fun making different designs to add to their hot chocolate. 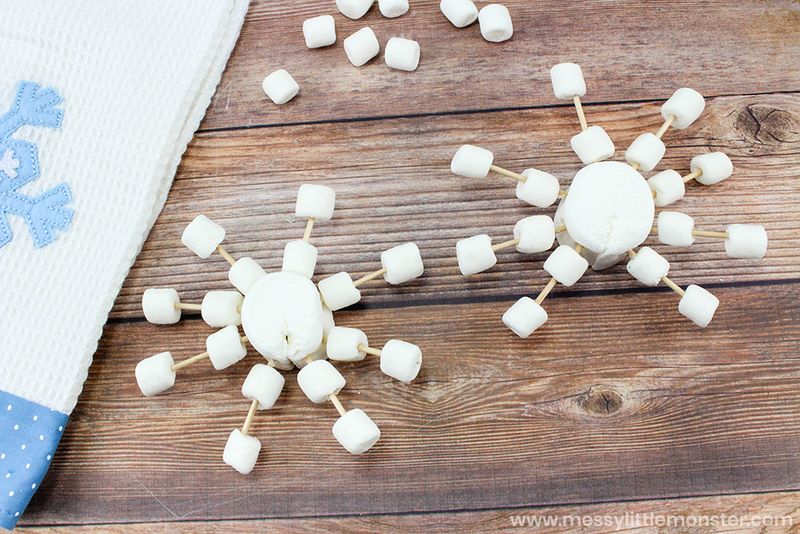 Making snowflake marshmallows is such a fun winter STEM activity to make snow days a little more exciting as well as being a fantastic fine motor activity for toddlers and preschoolers.